An Albany school bus, without outside traffic cameras, near the end of its run Tuesday afternoon. 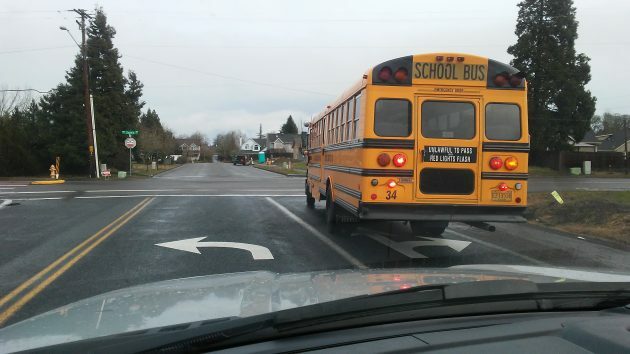 A bill pending in the Oregon House aims to discourage drivers from blowing past the warning lights and “stop” signs on school buses. To that end it would let police issue tickets based on video evidence from school bus cameras. The tickets would cost $435 each. The House Judiciary Committee held a hearing on the bill, HB 2460, on Feb.13 and has not yet acted on it otherwise. Mid-valley Reps. Andy Olson of Albany and Sherrie Sprenger of Scio sit on the committee. So if you have an opinion on the bill, let them know. Testimony before the committee, from the Department of Education’s man in charge of transportation, was that based on a one-day sampling, Oregon drivers fail to stop for school buses about 1,300 times a day. But since the start of the 2015-16 school year, not a single child has come to harm because of it. Bus drivers are under strict instructions not to let children cross the street until it’s safe. Under the bill, police could issue tickets to offending drivers after reviewing videos from school bus cameras. To make this work, buses would have to be equipped with outside cameras at an estimated $2,000-$3,000 per bus. Oregon has about 4,900 school buses. The cameras record video either during a bus’s entire daily runs or just when the bus driver activates the yellow warning lights. Bus drivers are supposed to activate the yellow lights 100-200 feet before stopping and turning on the red. But they don’t always, the committee was told. So this would be different from red-light cameras, where the timing of the yellow is uniform because it’s controlled by the machine. Issuing tickets would work the same as with red-light cameras. The registered owners of offending vehicles would get tickets in the mail. If they weren’t the ones driving, they could submit a sworn statement to that effect and the tickets would be dismissed. Olson and Sprenger asked questions about the procedure. Among other things, one or both of them wondered about people who no longer own the offending vehicles or don’t get the mailed citations and fail to respond in the 30 days allowed — and then end up being cited for failure to appear. The Trumpster wants to hire an additional 15-thousand federal employees, all of whom earn a good salary, earn a good federal pension, earn federal retirement rights and have a federally funded health insurance which non-federal employees cannot get for the same money. What’s that got to do with cameras on school buses? So much hate, you can’t even pay attention to the topic! Keep posting. We enjoy your misery. Excellent! Get all the scofflaws! The cameras are a solution to a very small issue. Likely there are many more pressing safety issues to spend money on. Safety is not a digital (read that as on-off) condition. Conditions have varying risks, conditions, and mitigation costs. Deborah Maskal submitted a comment via email: I have been in the school bus industry for the last 25 years, in the state of Oregon. No, maybe not one has been hurt in Oregon YET but it only takes a second of bad judgment for that to change and it could cost a life and career. Yes we are instructed to teach the students (K-12) to wait for instruction to cross when we see it is safe, we also teach the students to look for themselves. But the real fact, in the real world, kids don’t think and have the “it wont happen to me” syndrome, and don’t do as they are taught. I would like to know the statistics on the near misses. We could save the cost of the cameras, the time it takes to install and view the cameras then report if the citizens that drive would follow the laws in place. The statement is that Oregon drivers blow pass stopped school buses 1300 times a day. I presume this means buses with their stop signs up or red stop lights on. That is a very high number. I would really like to see the data behind this. If it is true, then this really is a bigger issue than I would have thought. Hasso reports that Oregon has 4900 school buses, so if all are in service each day, then this happens daily to (one of) every 3 or 4 bus drivers. Or, in other terms, this happens frequently enough to happen to each bus in 3 to 4 days. At a cost of $3000 per system, and a $435 fine, it would take 7 violations to pay for the each system. If a violation occurs every 4 days, then in 28 days, the money brought in would pay for the system. It would make sense to me to equip the buses first which have reported the biggest problem. Use the generated funds solely to pay for the systems on the bus — do not feed it back into the general government. Then use excess funds after paying off the systems to 1) roll it out to other buses and then 2) go into a fund purely meant to pay for bus costs (replacements, maintenance, drivers). This second priority would effectively free up education dollars for other purposes. If the incidents decline, as word gets out of the system, then funds will decrease, and it may not be necessary to equip all buses. In general, a bit of seed money to buses with highest rates of the problem, to be paid back in short order. Then use any funds to roll it out to other buses if needed and as funds are available.